A homemade Christmas tree, easily made from two tomato cages, that you can use either indoors or outdoors. If you have a couple of tomato cages left over from gardening season, then you already have the base for this pretty homemade Christmas tree. Wind a green evergreen garland around the cages, then decorate, or just add lights, depending on whether you’ll be using the tree indoors or outside. This tree is decorated with homemade ornaments. Please see our Christmas Crafts index for over 100 free Christmas craft projects, including lots of tree trim ideas. This project was very easy and this little tree looks magnificent, indoors or out! I kept it indoors last year, fully decorated, but this year, it’ll be outdoors with just lights… and of course a little accumulation of snow! Begin by inserting one cage into the other cage, then secure them together with a little wire. You will need the vertical wire sections separated from each other, to give an extra vertical post to secure the garland. Don’t worry if your tree appears a little crooked at this point because you can fill in any crooked areas with the garland so that it appears nice and straight. Beginning at the top of your tree, simply wrap the garland around the cage sections, securing it with the garland itself, as you go. Be sure to fill in any holes. You can wire the garland to itself, or the cage, to keep it secure. For the base of the tree, I simply wrapped a piece of white felt around the bottom area of the cage. 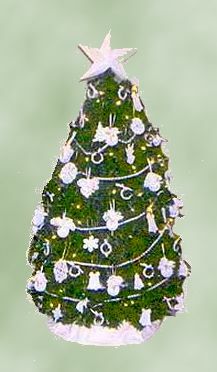 If you plan on using this tree outdoors, leave the bottom area free, to help with securing it to the ground, outdoors. Too keep it from blowing away outdoors, add a few rocks or small interlock stones on top of the cage wire at the bottom and the weight will help to keep your little tree in place.